This short article was originally published in the Guardian Edinburgh under the title ‘Spotlight on trams: Bordeaux’. The Guardian has given up its local experiment so this post, together with a similar article on infrastructure in Helsinki may disappear at any time from the Guardian’s pages – hence they are republished here. 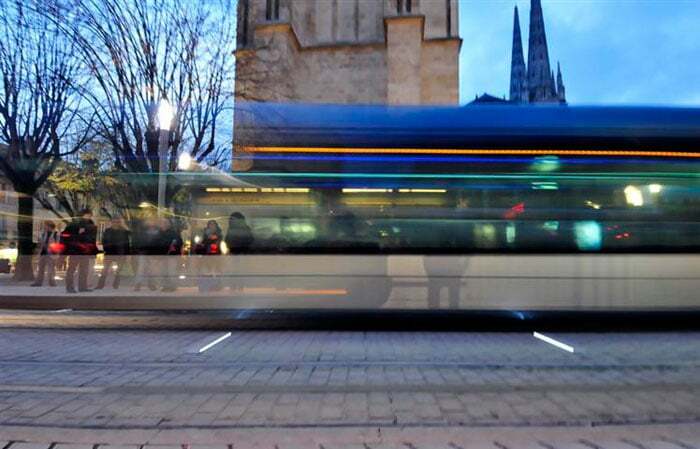 In the first of an occasional series looking at the experience of trams in other world cities, guest blogger Willie Miller finds that Bordeaux’s trams haven’t just moved people around, the ‘mobile social structures’ have changed the very development of the place. Bordeaux is a vibrant city of 250,000 people serving a metropolitan catchment area with a population of 1.1 million and is one of the largest urban areas in France. The city and its region are of course well known for wine but this is also a city that makes things: optical and laser research and production, aeronautical and defence industries as well as pharmaceuticals, food and electronics. It is also a significant administrative centre and a city attractive to tourists on the basis of the wine industry, the adjacent seaside resort of Arcachon and the city centre which is a UNESCO World Heritage Site. The built-up area has grown swiftly in the past decade and urban sprawl was considered to be a significant problem. In common with many other European cities, as Bordeaux expanded its periphery, industries around the core of the city declined most significantly along the banks of the Garonne. The first Bordeaux tramway dated back to 1880. In 1946 the public transportation system had 38 tram lines with a total length of 124 miles carrying 160,000 passengers per day. This system was abandoned in 1958 as a result of anti-tram arguments including the notion that trams hindered the flow of cars through the city. In 1995 the city elected Alain Juppé as its new mayor. He recognised the need for action to counter the strangulation of the city by transport problems and, together with a number of other initiatives, the city adopted the tramway plan in 1997 with the support of Central Government in 2000 as a Public Interest Project. This is a very European example of a politician supporting a major project rather than disowning it. The tramway network currently consists of three lines built at a cost of EURO 800,000. The first new line was opened in December 2003 and further extensions have increased the route length to just over 27 miles with more routes planned. The system is notable for using a ground-level power supply system in the city centre to placate the views of conservationists who considered that overhead wires would threaten the integrity of the World Heritage Site. The system is operated at the moment under a five year contract by Keolis, the largest private sector transport group in France. The overall transport system (bus-tram-rail) sees some 300,000 passenger journeys daily of which 165,000 are on trams. On average, 45% of journeys on the combined bus and tram network of the TBC are by tram. In 2008 the trams carried 54.7 million passengers. The Bordeaux tramway is one of 16 towns or cities in France running a tram system integrated with bus and rail. The impact of the tram on the city should not be seen just in terms of moving people around. It has had a much wider impact on the structure of the city and the way in which new development is allowed to take place. On the periphery of the city, the three tram routes define growth corridors along which development can take place. The new routes have defined new parts of the city where people live and work. 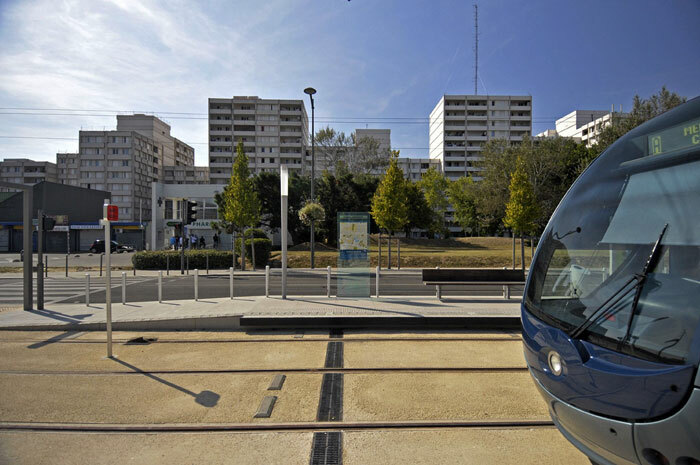 Tram stops become the focal points of new squares, the centres of new mixed use areas where employment and living space are co-located or the best way of getting to some of the city’s remarkable new spaces such as Michel Corajoud’s breathtaking Mirior d’eau opposite the Place de la Bourse on the banks of the Garonne. 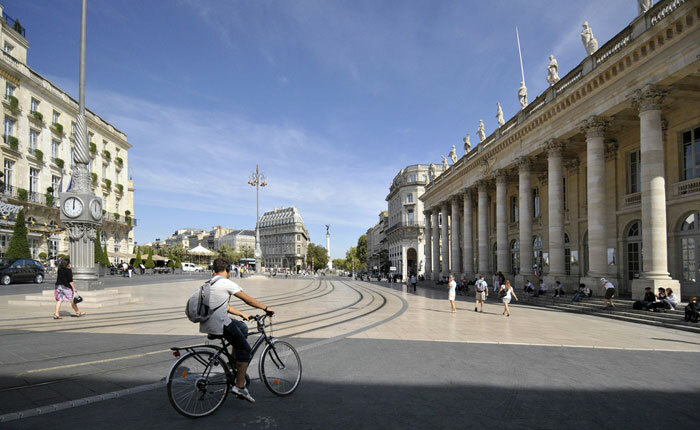 The tram has also allowed many traditional city squares to become areas of calm like the spaces around the Cathédrale Saint-André de Bordeaux or around Richard Roger’s Palais de Justice. Many of these spaces sit atop underground car parks so while the car can still penetrate the inner historic core, there is precious little evidence of its presence. 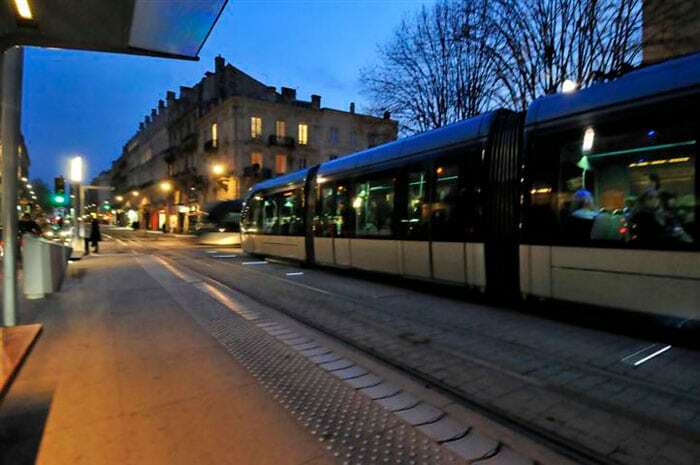 In Bordeaux the tram infrastructure enables easier orientation within the city. The tracks, overhead cables and stops are now permanent features of the city’s streets – predictable and stable unlike bus routes. So the tram informs and helps people to formulate a clearer image of the structure of their city. It is a feature of their communal public space. Tram stops in the city are typically focal points in the urban fabric where local shops, bars and cafes cluster or where students meet on the way to university. This perhaps sounds like UK Regeneration speak – and it probably is – but the defining of city spaces by public transport is a part of European urbanism that predates Lord Rogers and his Urban Renaissance by a century or more. Bordeaux’s trams are also mobile social spaces in a way that buses can never be – the arrangement of seats and standing space seems to encourage conversation. The tram is smooth running so that café au lait need not be spilled and the discussion started at the tram stop can continue without interruption. Bordeaux’s Trams have also created more walkable streets. There is little if any evidence of a city centre traffic problem whereas before their reintroduction, there was traffic chaos. Generally, trams attract heavier usage than buses so their introduction and development has created a virtuous circle of improved diesel-free environments for pedestrians, more walking and increased use of public transport. 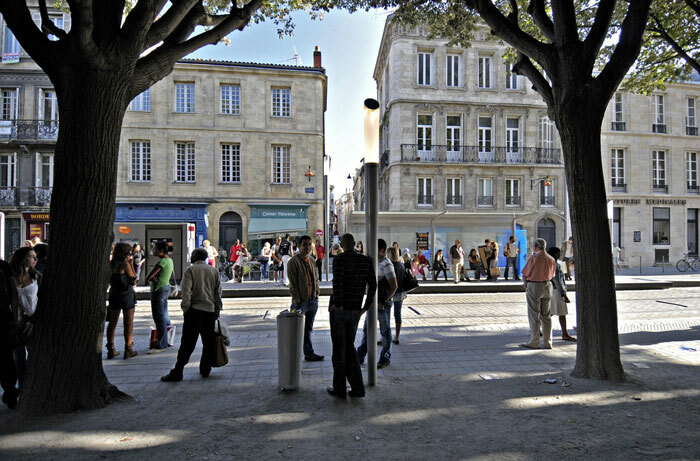 The brave steps that Bordeaux took at the end of the 20th century to reconfigure its transport system have effectively restructured the city and provided a new network of communal public spaces and a pedestrian priority city centre of which it can be justifiably proud. It is an excellent example which many UK cities should follow.